Scotland’s debate on its constitutional future has frequently focused on its future role within the EU. Despite uncertainty about the precise terms of an independent Scotland’s EU membership we show that the issue is not one that divides ‘Yes’ and ‘No’ voters. Furthermore, recent years have shown a marked rise in sceptical attitudes toward the EU in Scotland. The issue of an independent Scotland’s relationship with the European Union (EU) has intermittently animated the referendum debate. Most recently, the BBC’s Andrew Marr found himself in hot water after appearing to express a personal opinion on the difficulties that an independent Scotland might face in seeking to join the EU. Marr’s comment built on a statement, delivered on the same BBC programme, a month earlier by European Commission president José Manuel Barroso. “I believe it’s going to be extremely difficult, if not impossible,” remarked Barroso, for a new state emerging from an existing EU Member State to be admitted to the club. Scottish independence would present the EU with an unprecedented situation. Never before has part of an existing Member State gained independence whilst seeking to remain within the EU. There is no EU Treaty article dealing with the scenario and there is no relevant EU case law. The European Commission’s official position is that Scotland would have to reapply for membership and complete the standard accession process as Croatia did most recently. The Scottish Government has countered that, because Scotland has been part of the EU since 1973, it cannot be expelled. Instead of the standard application process followed by states such as Croatia, the Scottish Government argues that the EU Treaties ought simply to be amended and that Scotland should enjoy so-called ‘continuity of effect’, guaranteeing it the same opt-outs and special provisions that the UK currently enjoys. Whether through a formal accession process or an amendment to the existing Treaties, it is clear that each EU Member State would hold a veto in the process (although no Member State has yet to suggest they would exercise it). It is also clear that the 18-months between ‘Referendum Day’ and ‘Independence Day’ represents a tight, but not completely unrealistic, timeframe in which to agree and ratify a deal. Finally, it is also clear that to trigger a scenario in which Scotland would find itself outside of the EU would be deeply imprudent. It would cause significant turmoil by creating a hole in the single market and altering the legal status of every non-Scottish EU citizen living, studying, or working in Scotland. In addition to the pragmatic argument about keeping Scotland, uninterrupted, within the EU is a normative argument based on the EU’s general principles of democracy, self-determination, solidarity, and sincere cooperation. Excluding a part of existing EU territory, and several million existing EU citizens, because they exercised a democratic right with the consent and recognition of their parent state is hard to reconcile with those aforementioned principles. Whilst it is fair to conclude that “almost all independent expert analysis … [agrees] that Scottish EU membership would be uninterrupted,” there remains ambiguity over the precise details of the relationship. In terms of the broader political debate the EU issue has simply become grist to the mill of two meta-narratives. For Yes Scotland the EU is one of the many ways in which an independent Scotland would remain deeply embedded in existing political and economic structures. For Better Together the EU is yet another issue on which ‘no guarantee’ exists. But does this ambiguity pose a barrier to voters in the referendum in making up their minds? The answer is no. The EU issue is not one that appears to be decisive in the formation of people’s views on the referendum question. Put simply those voters indicating an intention to vote ‘Yes’ cannot be distinguished from those planning to vote ‘No’ on the issue of an independent Scotland’s membership of the EU. Figure 1, showing data from the 2013 Scottish Social Attitudes Survey, illustrates this. 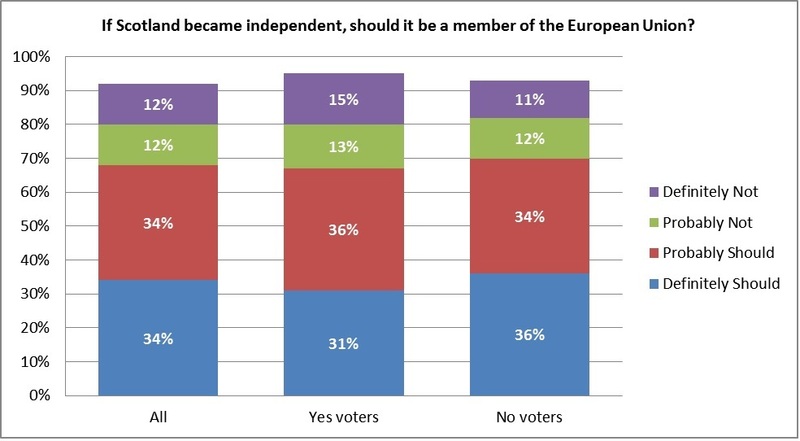 67% of ‘Yes’ voters favour an independent Scotland being part of the EU while 70% of ‘No’ voters think the same. There is no marked difference. Source: Scottish Social Attitudes Survey 2013. Missing percentages to 100 indicate ‘don’t know’ responses. These results, from the only representative probability sample-based survey, have been externally validated by polls that asked people more directly about the issues that are most relevant to them in making their decision about the referendum. When, for example, asked which issue was the most important to people in a poll conducted in January 2014 only 3% of respondents said EU membership. Such findings might surprise those who think Scots are particularly Europhile and enthusiastic about the EU as to opposed to voters in England where the UK Independence Party is an increasingly potent force. Indeed it is often suggested that Scots have a distinctively positive view of the EU compared to their neighbours south of Hadrian’s Wall. Such an image of Scots is far from accurate. Attitudes towards the EU have grown more sceptical in Scotland. 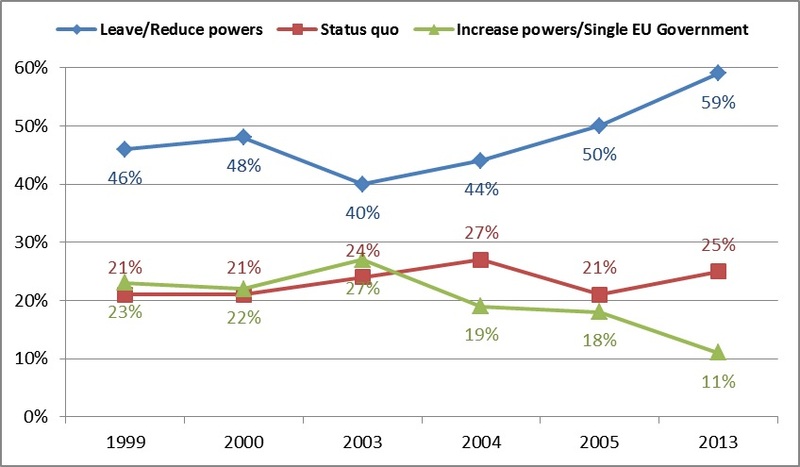 As figure 2 shows in 2013 59% of Scots would have liked either for Britain to leave the EU (19%) or to see the EU’s powers reduced (40%), substantially more than at any previous time that Scots were surveyed on this question in the Scottish Social Attitudes Survey. While the majority still prefers for Britain, or an independent Scotland, to remain part of the EU, Scots are far from being Euro-enthusiasts. So why have Better Together been focussing on the EU issue? Two explanations are plausible: either they wanted to have the political and media agenda dominated by an issue that is not a vote winner – preserving their lead in the polls and trying to ensure ‘Yes’ could not shift the discourse to more decisive themes. Indeed a lot of attention has been paid to this issue without showing any significant effect on the polls. If however, Better Together tried to win more ‘No’ votes, the strategy was not successful, as voters do not seem to respond to the topic in either direction. Jan Eichhorn is a Chancellor’s Fellow in Social Policy at the University of Edinburgh. His research focuses on political participation and culture as well as subjective well-being and unemployment. He is the Principal Investigator of two ESRC-funded projects examining public attitudes to the referendum of adults and young people respectively. Daniel Kenealy is Lecturer and Associate Director at the University of Edinburgh Academy of Government. His research focuses on the history of European integration and British foreign policy, including UK-EU relations. Since December 2013 he has been adviser to the Scottish Parliament’s European and External. This entry was posted in Europe, Nationalism, Uncategorized, United Kingdom and tagged EU membership, Scotland, Scottish independence, secessionism. Bookmark the permalink.